This orchid, which is also known as Stemless Lady's Slipper, is widespread across Canada and the United States. An unmistakeable orchid, Cypripedium acaule grows to around 40cm in height. It has a distinctive pair of deeply keeled basal leaves and each stem carries a large, deep-pink slipper-shaped flower. A white form, Cypripedium acaule forma alba is also recorded. 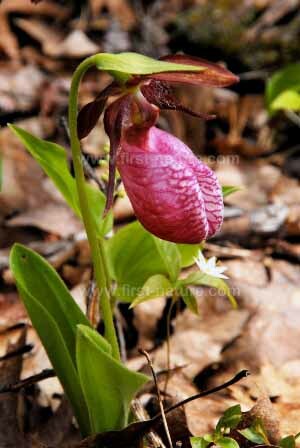 The distribution of the Pink Lady's Slipper is centred on the northeastern United States - the high zones of the Appalachian Mountains, the Great Lakes area, northern Ontario and Newfoundland. The main habitat of Pink Lady's Slipper is coniferous forests, but it is tolerant of other habitats and sometimes apperars in meadows, roadside ditches, bogs andsand dunes - and even on railway sidings and cuttings. This orchid has a long flowering time, and individual flowers can remain in good condition for over three weeks in a cool season. 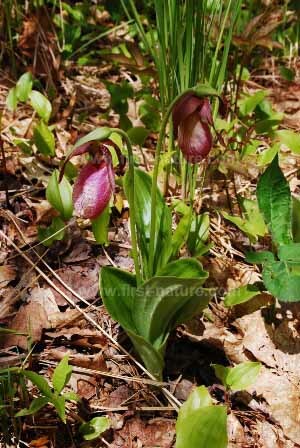 Beginning in May, Pink Lady's Slipper flowers are often found well into June, at which time in good sites these lovely flowers carpet the ground. 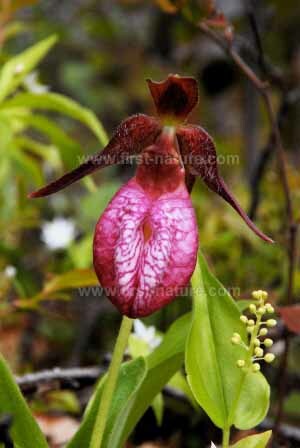 In Europe, our closest relative to the Pink Lady's Slipper Orchid is the Lady's Slipper Orchid Cypripedium calceolus. In the UK, the known native plants were reduced to just one specimen in Yorkshire. Today the Lady's Slipper Orchid is the subject of a re-introduction programme which is taking place at Gait Barrows National Nature Reserve in Lancashire. In other northern European countries, including Sweden, Norway, Finland, Denmark, Austria and Switzerland, the Lady's Slipper Orchid still flowers relatively freely, but it cannot be described as common anywhere in its range.